HomeGold IRA BlogGoldWhat Happened to Gold Yesterday – Who, What, When, Where, and Why? Brendan Conway of Barron’s wrote an article yesterday asking What the Heck Just Happened to Gold and Precious Metals? Many other market-watchers are probably asking this same question, and more importantly, they are asking who, what, when, where, and why. The Fed’s announcement made on Wednesday night of downgraded growth forecasts for the U.S. economy as well as continued lower interest rates did not surprise. Seeking Alpha even called it “almost an exact copy of the previous statement.” The latest jobless claims numbers did not surprise much either, being in line with forecasts by falling by only 6,000 (from 318,000 to 312,000). So why did gold for August delivery go up $41 yesterday, a three-week high and its biggest daily gain in nine months? Conway stipulates in his Barron’s piece that “the market is growing increasingly skeptical of the Fed,” therefore investors are turning to non-Fed assets such as gold. He cites the Lindsey Group’s Peter Boockvar who believes investors are doubting the Fed and its recent statements, and reflecting that sentiment through their activity in the market – activity (buying gold) that suggests a more negative economic outlook than that of the Fed. Janet Yellen, the Fed’s Chairwoman, even referred to the latest higher inflation data as just “noise”. Investors, on the other hand, seem to be hearing the data as loud, warning noise. In addition to these economic happenings, violence and tensions in Iraq and the Ukraine/Russia border have escalated over the past three days. A large nationally-owned oil refinery was taken over in Iraq, and Russian troops have been building on the Ukraine/Russia border. 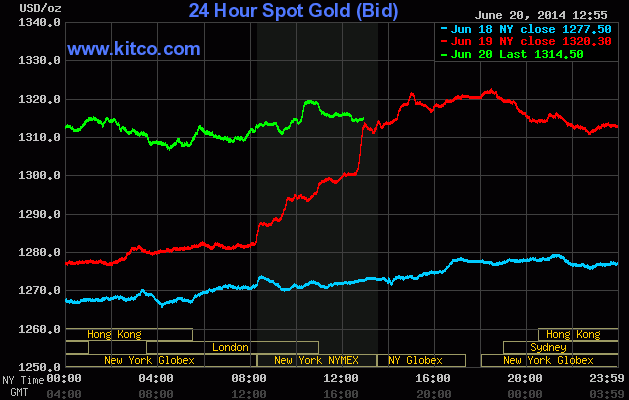 Today, according to Kitco, gold is down slightly to $1,315.70 from a high of $1,320.30 yesterday.